Navy grog is one of those cocktails that has so many variations that you would be lucky to find two recipes that match. The likely reason is that there are quite a few ingredients in this drink. As it was passed from bartender to bartender, things were missed, added, misinterpreted, or simply personalized. The drink began exactly as it sounds, as a refreshment for British sailors. It was a way to enhance and preserve the water they stored on the ship and get vitamins to fight diseases such as scurvy. 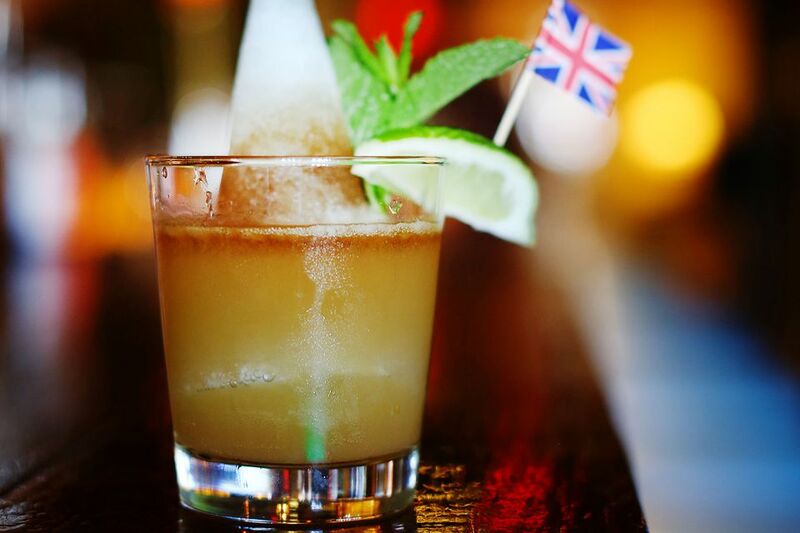 This grog dates to the mid-1700s and was typically a mix of rum, water, honey or molasses, lemon, and cinnamon. It was served either hot or cold. The Navy grog recipes that are most familiar today stem from the tiki movement, which began in the 1940s. It is said that Don Beach was the first to mix it up. Trader Vic's has a claim on the cocktail's conception as well. Both of their recipes are featured here, with Don the Beachcomber's being this first listing. Try each to see which you like best. Pour the rums, juices, and syrups into a cocktail shaker filled with ice. Garnish with an orange slice and cherry skewer. Honey syrup is simply watered-down honey, which makes it easier to mix into drinks. To make it, combine equal parts of honey and water and mix it well until you get an even consistency. Trader Vic's Navy Grog: There is not a big difference in this recipe from Don the Beachcomber's above. The key difference is the use of pimento dram (or an allspice syrup) in place of the honey syrup. Also, notice that less grapefruit is used here and this is one of the few Navy grog recipes that skip the soda. This cocktail is shaken and served over a mound (or customarily, an inverted ice cone) of finely shaven ice with a straw stuck inside. Dale DeGroff's Navy Grog: Dale DeGroff (also known as King Cocktail) has a completely different take on Navy grog in his book, "The Craft of the Cocktail." It certainly leans more to that traditional 18th-century grog of British sailors and is an equally great cocktail as the tiki drinks above. Shake the ingredients with ice and pour into a double old-fashioned glass. How Strong Is a Navy Grog? Estimating the alcohol content on a drink like this is tricky. Each of the rums can be stronger than 80 proof, and the volume of soda can vary when it's included. Don Beach's Navy grog mixes up to around 18 percent ABV (36 proof), for instance. Trader Vic's, on the other hand, is a little stronger at 22 percent ABV (44 proof), or so. The lightest of the three, DeGroff's version mixes up to 12 percent ABV (24 proof), or about the strength of a Rum & Coke.